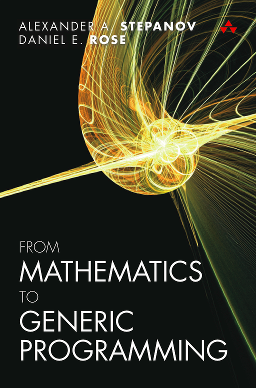 From Mathematics to Generic Programming (FM2GP) is a 2015 book from Addison-Wesley. Alexander A. Stepanov studied mathematics at Moscow State University from 1967 to 1972. He has been programming since 1972: first in the Soviet Union and, after emigrating in 1977, in the United States. He has programmed operating systems, programming tools, compilers, and libraries. His work on foundations of programming has been supported by GE, Polytechnic University, Bell Labs, HP, SGI, Adobe, and, since 2009, A9.com, Amazon’s search technology subsidiary. In 1995 he received the Dr. Dobb’s Journal Excellence in Programming Award for the design of the C++ Standard Template Library. Daniel E. Rose is a research scientist who has held management positions at Apple, AltaVista, Xigo, Yahoo, and A9.com. His research focuses on all aspects of search technology, ranging from low-level algorithms for index compression to human–computer interaction issues in web search. Rose led the team at Apple that created desktop search for the Macintosh. He holds a Ph.D. in cognitive science and computer science from University of California, San Diego, and a B.A. in philosophy from Harvard University. The following are interviews with the authors, discussing issues related to the book as well as other topics related to their work and interests. January 2015 Slashdot interview, with questions chosen by the community and edited by Rob "samzenpus" Rozeboom. February 2015 InformIT interview conducted by computer scientist and author John Lakos of Bloomberg. 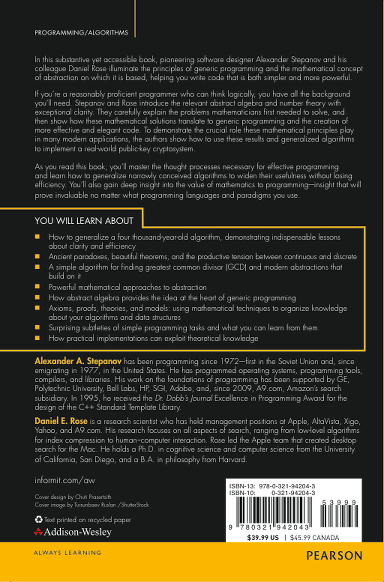 Elements of Programming (EoP) by Alexander Stepanov and Paul McJones. This book provides a more formal treatment of many of the ideas in FM2GP. "Turning Egyptian Division Into Logarithms" -- David Sanders shows how to extend one of the algorithms discussed in both FM2GP and EoP.